Opponents of Proposition L, a proposed San Francisco initiative known as sit/lie that would criminalize sitting and lying down on public sidewalks, have made their presence felt across the city in a variety of ways, such as posting No on L signs, organizing city marches and promoting online campaigns. But Kathleen McGuire is taking a less conventional stand against the sit/lie motion: She’s started a choir. Protest songs, after all, need protest singers. McGuire, a choral conductor who has served as the artistic director of the San Francisco Gay Men’s Chorus since 2000, is the founder of Singers of the Street, a new vocal ensemble with both homeless and non-homeless members. McGuire formed the chorus in September to fight Prop L and raise awareness about homelessness in San Francisco, a city with an estimated homeless population of more than 7,000. The chorus made its second public appearance on Wednesday following almost two months of weekly rehearsals at the Metropolitan Community Church in the Castro. 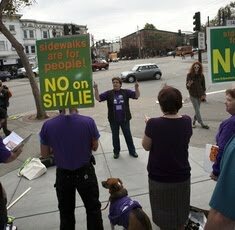 Dressed in purple T-shirts to match the choir’s logo and waving No on L signs, ensemble members performed a cappella renditions of polemical songs like “Bambelela (Never Give Up)” and “We are the Ones” to passersby around the Castro. Some of the numbers included Prop. L-specific lyrics (“we’ll sit and lie together, we shall not be moved”) to further underscore their message. Protest songs may not be as much of a staple of mainstream culture today as they were in the 1960s when the likes of Bob Dylan, Joan Baez and Pete Seeger galvanized thousands at anti-Vietnam War rallies. “There isn't a market for protest songs like there was in the '60s,” Tommi Avicolli Mecca, a San Francisco-based writer and activist, said. This is especially true in the Bay Area, which, as an epicenter of countercultural movements, has long been a focal point for music with a social message. Local rocker Neil Young, for instance, maintains a long list of contemporary protest songs and videos on his “Living with War Today” website. The East Bay’s iconic pop-punk band Green Day has sold more than 15 million copies of “American Idiot,” its rebellious 2004 Grammy Award-winning album, and Oakland-based rap artist Young Gully is attracting international attention from the hip-hop community for “The Oscar Grant Project,” his recently released tribute to the 22-year-old who was fatally shot by a BART police officer on Jan. 1, 2009. The region’s bars and clubs also continue to book local, issue-focused singer-songwriters such as Robert Temple, Justin Ancheta and Jenny Kerr. But the extent to which protest songs can motivate the masses to act remains the main challenge facing politically conscious musicians. “When I started, I thought I could change the world with my songs, but I can’t really,” Temple said. Singers of the Street will have to work hard to get its message across. The men in the chorus far outnumber the women, making standard soprano-alto-tenor-bass song arrangements difficult to pull off. The members' widely varying musical abilities produce mixed results. And the single rehearsal location prevents some people from attending. McGuire hopes to increase membership by passing out fliers and connecting with homeless action groups and the local police force, and she also plans to rehearse in several neighborhoods in the future.